Where can I find my Joules gift card balance online? You can check the balance of your Joules gift card online here. Joules started out life selling colourful Wellington boots at country fairs, and has expanded throughout the country and enjoys particular success overseas in Germany and the USA. Joules has 97 stores in major towns and cities and their country-inspired ranges can also be found in top department stores, including John Lewis. You can find your nearest Joules store here. How can I find out the balance on my Joules gift card? Find the balance of your Joules gift card here. Alternatively, present the card in any of Joules’ stand-alone stores in the UK and a member of staff will be pleased to tell you the balance. Joules customer services are on hand should you experience any difficulties with your Joules Gift Card on 0345 250 7160 (note: this telephone number is charged at standard rates and will be included in your mobile bundled minutes. This telephone number is operated by Joules Limited). Where can I spend my Joules gift card? The Joules gift card card is welcomed in any of the 97 Joules stand-alone stores in the UK. The Joules gift card cannot be redeemed in Joules concessions in department stores. Joules gift cards are also available for use on their website at www.joules.com. Where can I buy a Joules gift card? The gift cards are on sale in all Joules stand alone stores, and can also be bought online for delivery by post to you or your intended recipient. They are available for amounts from £10 to £1000 and they have a selection of colourful designs for you to choose from. They can be purchased directly from the Joules website here. Is there anything else I should know about using a Joules Gift Card? 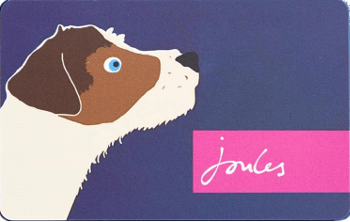 Joules gift cards are valid for 24 months from the last transaction. A balance enquiry does not count as a transaction for this purpose, but a purchase, refund or ‘top-up’ (available in-store) does.